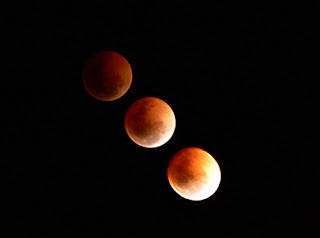 I've been laid up with the flu, and not up to much, but I thought I'd pass on some readers images of the Lunar Eclipse. Note that these images are copyright of their takers, so please play nice ask as permission via me if you want to use them. The top two are from Tony Travaglia of New Zealand. They show the start and well into the eclipse, rather beautiful effects on the first one. The left hand image is from Steve Bollipo of Launceston, and shows an interesting overlay effect of the eclipsed Moon when taken in apeture mode. The right hand image is a an overlay from Andrea Deegan of Albany, Western Australia. It very effectively shows the shadow deepening on the Moon. Many people spoke of seeing the Moon "in 3D" as the shadow advanced. Did anyone else have this feeling? Tuesday morning arrived with a nice clear sky, but then it went rapidly downhill. By the early afternoon the sky was thick with clouds. Trudging home there were a few flecks of blue on the horizon. But still I was resigning myself and the several friends and Neighbours we had invited around to watching the eclipse on Webcams. But as we set up for our visitors, the clouds began to part. Large chunks of blue appeared, as I set up the outdoor table for nibblies. I set up three telescopes, the 8" Don Memorial reflector, my old 4" and my very elderly 50 mm. Setting up was a bit of guess work, I made a stab at where the Moon would rise, and tried polar aligning the reflectors as best I could without the Southern Cross to guide me. Guests began to arrive, children began to race around the back yard while I nervously protected the scopes, Pizza began to crisp in the oven. All we needed was the Moon. Which was conspicuously absent, I checked SkyMap again, the Moon should have risen. So I moved around the back yard seeking vantage points, to discover the Moon had inconveniently risen behind the only substantial tree on our western horizon. By judicious jiggling, I was able to set up the 4" scope where it had full Lunar visibility. Unfortunately this was also where the mosquitoes, awoken from their winter slumbers by unseasonal warm weather, were at their thickest. Lunar gazing was alternated with Mosquito slapping. Then the time came, right on cue a discernible chip was seen on the bottom (eastern) edge of the Moon). Kids stopped rushing around and kids and adults mobbed the telescope. Expression of awe occurred and questions came thick and fast. After a while food and running about gained hold of peoples consciousness. I was shuttling back and forth between the telescopes, making sure they were still on target (having not properly polar aligned the 8", it drifts off slowly, and the 4" doesn't have a drive, and has to be manually adjusted at regular intervals) as even with other distractions there was always someone at the scopes. The Moon dimmed, the sky grew darker and stars began to appear, the shadowed part of the Moon was clearly a deep red colour. As well as running 3 scopes, I was running 3 cameras. I was using the mobile phone with the 4" scope (see images at the start of this post), the Olympus digital was running solo (shots in middle), and the Pentax SLR film camera got slotted into the 8" in the rare breaks between observers. Quite often astronomy is a solitary passion, looking at the stars represents moment of quite joy and contemplation. 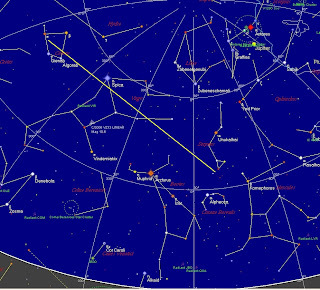 But for events like this, eclipses, big meteor showers, having lots of friends present gives it a really fantastic vibe. We were all in the presence of a moment of rare cosmic beauty, and we were all sharing as one. Finally the last sliver of moonlight was extinguished, and the Moon was reduced to a deep copper disk with the glowing belt of the Milky Way up above. A superbly beautiful sight. After contemplating this for awhile, practicalities took over, kids had to be taken home so they could be sent to school in the morning, dishes were to be washed, chocolate cake eaten, people walked to cars. All of a sudden, it was quiet. The Bettdeckererschappender Weisle and I, and two of our hardier friends, enjoyed a quite cuppa under a copper Moon. Then a blaze of white light announced the end of the eclipse, we headed inside, ready to begin our normal lives, all being touched by this cosmic spectacle. Of course, the next morning we had all come down with colds, so we had obviously been touched by something else as well. It will go live from 6:00 pm AEST tonight. Check it out even if your view is clear, it's pretty good. Don't forget folks, tonight (Tuesday August 28) there is a total eclipse of the Moon. A table showing contact times is here, and a printable PDF with contact times and some kids activities is here. 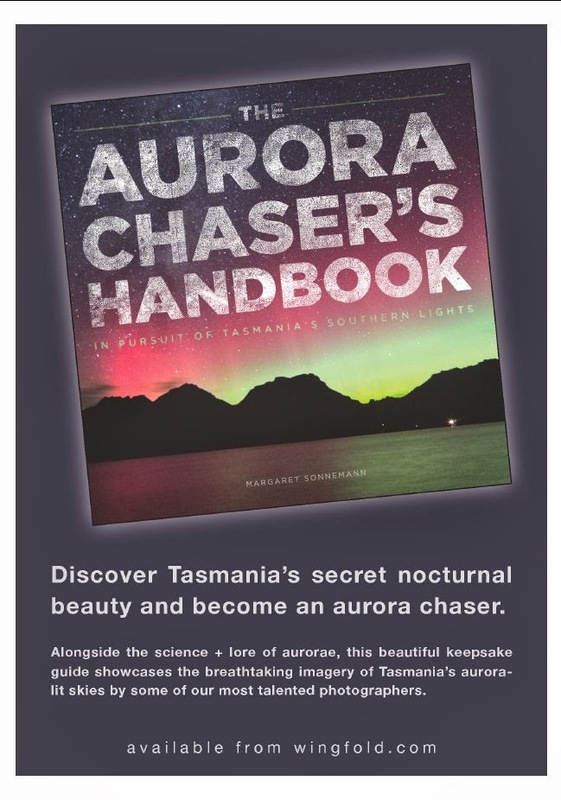 The weather looks like it is going to be fine on the night, but just in case it goes pear shaped, the Discovery Channel will be streaming live feeds from telescopes around Australia (including telescopes run by some of my colleagues from Sky&Space). 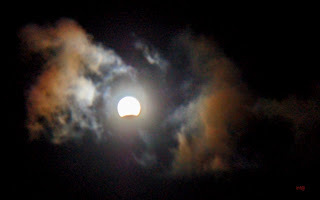 The ABC Science Online Unit will be covering the eclipse too, as will SpaceWeather. Amateurs watching the eclipse with telescopes can also watch for meteor impacts on the Moon. On September 1 there is predicted to be a brief outburst of the Aurigid Meteor Shower. Meteor observer Chris Crawford wants to correlate the observations of a multitude of observers across the western USA to assemble a 3D model of the Aurigid stream. mouse. The trick here is that most laptops are synchronized to an Internet time standard, so the time data recorded will be meaningfully correlated between observers. Those times are assembled into a data file that the user emails to Chris on the morning after the Aurigids. This is an excellent community participation project. So if you are interested in participating in this project, see the Auriguid Laptop Meteor Observation Project page, and see here for detailed instructions. Sadly, the Auriguids are very low on the horizon from Australia, and we can only observe 7 hours after the predicted maximum, so we we will be unlikely to see anything. But if any of my US readers are interested, give it a go! The Mars Hoax say that Mars will look as big as the Full Moon tomorrow night. It won't. 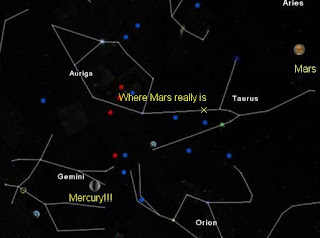 Mars is visible only in the morning, and it will be a birght orangish point of light below the Hyades. vey pretty, but not big. Google Sky has a bit of a problem with planetary positions. Google Earth has been quite useful to the astronomically inclined. You can tour great telescopes, locate known meteor falls, find previously unknown impact craters and set up occultation visibility maps. Now Google Earth has been updated to include sky maps. You can download the new sky-enabled version here, findout out the basics here, and get some cool KML tour files here. Google Sky won't replace SkyMap, or Sky View Cafe, or any of those specialist sky viwing programs, but as DaveP says, that's not the point. DaveP very rightly points out that the strength of Google is in mashing together data streams. DaveP goes into some detail on this, so check it out, then start making mash-ups. More serious is the fact that the planets are way out of position. You have to turn on the layers to see the planets in the first place. As you can see from the image above, Mars is well out of position, and Mercury is placed in Gemini, when it should be in Leo! This is because the program seems to default to 21 July when putting up the planets, unless you notice the time slider at the top, and move it to your current date, it will show you the planets as of July. I'd also like to the stars as seen from the southern hemisphere have a southern hemipshere orientation, but that is a minor issue. The 17th Carnival of Space has landed! Over at the Planetary Society Blog Emily Lakdawalla has put up the 17th Carnival of Space. From Dark matter and new plusars to finding a good pair of binoculars for astronomy, there is something for you there. So why not blast off over and touch down on some good astronomy reading. Want to submit an entry for next week? Here are the instructions for submissions. Next week's Carnival will be hosted by Out of the Cradle, and the following week it will return to Universe Today. A few days ago I wrote that Venus would enter the field of View of the SOHO C3 camera. It skidded just out of view along the bottom of the image. The only thing you can see is part of the diffraction spike due to Venus. Still, Mercury and Saturn put on a nice show. You can see a nice video of them passing each other (2.5 Mb version here, 0.3 Mb version here). Keep your eyes peeled, by the end of the Month Mercury will be easily visible in the western twilight at evening, and Venus will be visible in the morning twilight. Speaking of Venus, Top of the Lawn has a post on observing Venus at conjunction with the Sun, and there is a beaut post at Spaceweather on the same thing, with a fantastic image of a very thin Venus crescent. Moon as seen at 7:00 pm ACST facing east on August 28. The Moon is half covered by Earth's Shadow. This coming Tuesday, August 28, there will be a total eclipse of the Moon. This will be the best total Lunar eclipse visible from Australia since 1999. A lunar eclipse occurs when the Moon enters the Earth's Shadow. While not as dramatic as a solar eclipse, a Lunar eclipse has a calm and serene beauty of its won. At the height of the eclipse, the Moon should be a deep copper colour. The majority of the eclipse occurs in the early evening so the whole family can watch it. You don't need any special equipment to see it, just your eyes (although binoculars will be helpful). 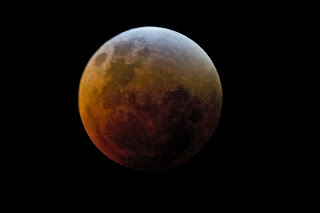 Why not have a lunar eclipse viewing party in your street? For the eastern states and central states, the Moon enters the darkest part of Earth's shadow (the Umbra) during the late twilight. For people in WA, the Moon rises with the eclipse underway. A table with contact times for all Australian States, and New Zealand (and links for other countries) is here at Southern Skywatch. I have made a printable PDF file with the Australian eclipse contact times and diagrams for handy reference on the night. It also has Kids eclipse activities on the back. You can download the PDF file here. Hopefully, the weather will be alright on the night. You can check the weather here. Yes, the Mars Hoax is still with us. People are still getting the Mars Hoax email (See the Zombie Mars Hoax that would not die). No, Mars will not rival the Moon on August 27, see this nice NASA post for the full story. Drop in to the NASA Mars Rovers page for the latest news about the dust storms and the Rovers (things are getting better, or check out the International Mars watch images. UPDATE: I wondered why I was persistently getting lots of hits on a readers photo of a double Moon mirage, it turns out it's people searching for the "double Moon" (Mars as big as the full Moon) of the Mars hoax. Feh! Taurus now has two burning red eyes. The steadily brightening Mars is now positioned near the red star Alderbaran to make it look as if the majestic bull has two eyes (click on image to elarge it for a better view). . Mars moves away over the next few days, but if you are up at 5:30 am look to the north for a very nice sight. This has been a bit of a week, and a bit of a weekend. I've been rushing to finalise my (overdue) Sky&Space contribution, in between dealing with urgent work stuff and deceased laptops. Then Friday a friend took sick and we did a bit of emergency baby sitting. Saturday was the Bettdeckererschnappender weisles turn to come down with something, so I haven't finished my article yet. But I did finally receive a cable release for my SLR camera. Inspired by the Oliphant Science Awards where we saw my niece's time machine, I decided to try it out. It was then that I discovered that the T-adaptor that worked so well with the 4" scope has the wrong focal length for the 8" scope. That means I can't get the Moon in focus with my current setup, so I have to get another T adaptor (sighs expressively). But the Moon was bright, and it was the best weather for days, so I grabbed the mobile phone and did a bit of experimenting. The images you see are the mobile shooting through 30 mm, 12.5 mm and 6.5 mm lenses (click on the images to enlarge them). The 30mm lens gives us the whole Moon, but is vastly over exposed. The 12.5 mm is best, giving reasonable detail, and good exposure (I have applied a light unsharp mask to the image, but it is otherwise untouched), but the full image of the Moon doesn't get in the frame. The 6.5 mm has good magnification, not so bad exposure, but is significantly blurred (and this is the best of a series of shots, the others were very, very bad). The problem with the higher magnification is keeping the blasted phone still while taking a picture, holding the camera to the lens, I found that the thing wobbled with my heart beat! I tried attaching the phone to the scope with rubber bands. This worked in the sense that the image was stable. But when I tried to press the button to take the image, no matter how carefully, I always moved the phone. The button is significantly off axis, and is not supported by a piece of telescope, and so must wobble when pressed. I will think more about this, and see if I can come up with a solution. Now that's a Nice Time Machine! So we hung out with the cousins today, then went and saw my niece's entry in the SASTA Oliphant Science Awards (SASTA being the South Australian Science Teachers Association). The Oliphant Science Awards are for School Projects, which are on display this week as part of Science Week. There were inventions, models, constructions posters, software and essays. The standard was pretty high, some of the posters were outstanding. One of the clear themes in the projects was a concern for the environment, there were solar power and water saving projects aplenty. There were also plenty of solar system projects and a few rockets. I asked middle one if he wanted to go into the competition next year as a rocket makers, but I don't think he was impressed with the idea. The image here was the entry from my niece's group (shes in reception/kindergarten). It's a model of a time machine, with flashing lights and working air conditioning. I think it's great! 10TH National Science Week Begins! This weekedns (18th and 19th of August) sees the start of the 10th Annual National Science Week. There is lots of Sciencey Goodness in the coming week, and you can search for local events at this web location. The ABC is holding lots of events Australia wide, and have a display of the gear used on the iconic "Why is it so?" program. there are great things happening for schools. Here in South Australia the South Australian Neuroscience Institute is putting on "The Body In Mind", and there are LOTS of astronomical events, like the visit from Jack Bacon. Check it out. Well, Venus, Mercury and Saturn are all too close to the Sun for us Earthbound observers. But they are very clear to the SOHO and STEREO spacecraft. This image if from the 15th at 16:42 UT, it capturse Mercury, Saturn and the Star Regulus. Venus isn't in the frame yet. It should turn up the the SOHO images in the next 24 hours, scraping along the bottom of the image. 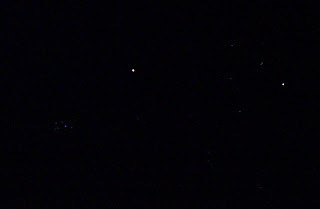 Mars almost forms a straight line with the Pleiades and Alderbaran in this image (click image to enlarge) taken on Tuesday morning. A very pretty sight. 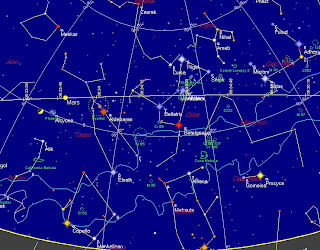 Comparison between a STEREO image (05-08-2007, 08:09 UT) and SkyMap chart. 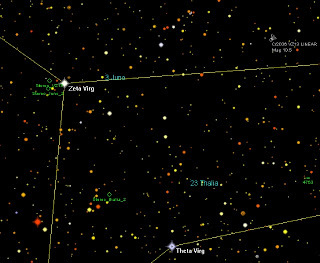 In the chart, the Earth Centric position of Asteroids Juno and Thalia and Comet VZ13 are shown, as well as the positions of these objects as seen from the Stereo spacecraft (yellow circles). 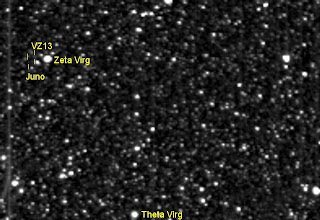 In the Stereo image, major stars and the position of Juno and VZ13 are labeled. Click on images to enlarge. A little while ago I was lamenting the problem of parallax and how it made locating dim asteroids and comet problematic when examining STEREO images for unknown comets. Because the spacecraft are substantially ahead or behind of Earth, asteroids, planets and comets will appear in different positions to those found on an Earth based ephemeris or chart. And the shift will be different for each object, so finding one is of limited help in finding others. I tried writing an Excel spreadsheet to calculate the parallax shift, but my limited maths meant that my spreadsheet sort of worked, but was substantially out for large parallax objects. Then Rainer Kracht and Colin Drescher of Stereohunter pointed out that the JPL Horizons program will let you find the position of objects as seen from a number of solar system objects, including the stereo spacecraft. This is fantastic, and the answer to our parallax problems. You need to know that in the "Observer location" input field you type "@stereo-a" or "@stereo-b" and for the target input field for asteroids you type in the asteroid number (and comets you have to type slightly abbreviated names eg c/2006 VZ13). Once you have that, the program comes back with a nice list of RA/DEC values. You can look them up manually in your planetarium program, or some programs, like the one I use (SkyMap) have a facility to input RA/DEC values and display them on the map (in SkyMap this is QuickCatalog). The resulting map looks like the chart above, where you can clearly see the offset between the Earth-centric positions and the objects as seen from STEREO-A. 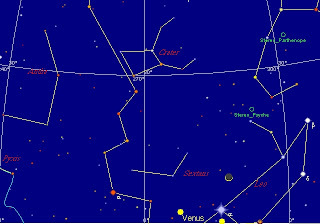 So, now a nice challenge, Comet Al suggested we look for images from 5 August, when the asteroid Juno and comet VZ13 cross near a bright star. The resultant image from a few frames before they cross is up above (it is 20070805_000920_S4h2a.fts, with the upper left as 0,0 pixels, VZ13 is at 460, 385 and Juno is just below and to the left). You can see the animation here (0.2 Mk AVI) which shows the crossing quite nicely (this occurs on 20070805_080920_S4h2a.fts). You would think that with the parallax problem solved our problems are over. Well, not quite. I couldn't actually find Juno until I made the AVI, on the original images, even with animation, background noise confused me. And I still can't find Thalia, it's in the image and animation somewhere. But at least our lives are at lot simpler, thanks to Rainer and Colin. The JPL Horizons program also has a email-based batch interface, when you have a number of objects the web based from is tedious, see the main Horizons page for details and instructions. This Tuesday evening is the last time to see Venus, after this, it will be too low to the horizon to see. Heck, even now it is pretty close to the horizon and not easily visible. Tuesday evening Venus will be a scant two fingerwidths above the horizon half an hour after sunset, with a very thing crescent Moon above and Regulus nearby, it will be difficult to catch, but worthwhile to farewell our beacon of the evening. Mars is now midway between the Hyades and pleaides (click image to enlarge it so you can see the detail). 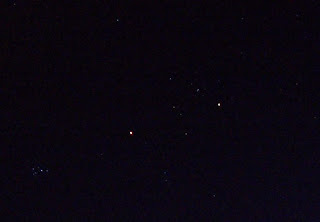 This is a very attractive moring sight, with Orion nearby. 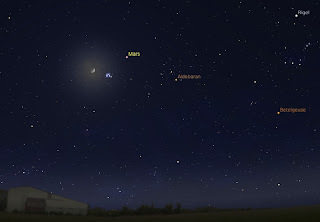 Soon Mars will be close to Alderbaran, giving Taurus a second eye. 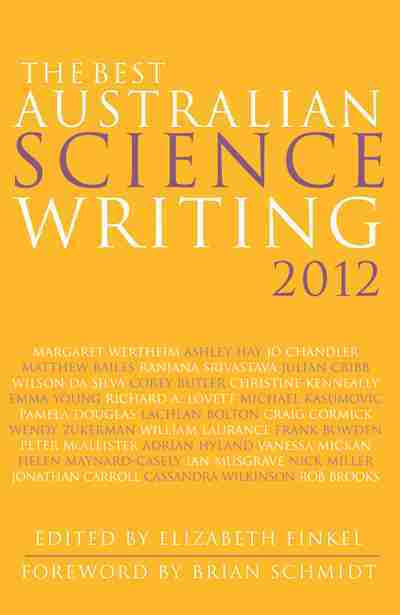 Science Week offically runs between 18 and 26 August, but this weekend in Adelaide (11-12 August) there is Science Alive! at the Wayville Pavillion in the Adelaide Showgrounds. Science Alive! is free, and sitable for all ages. There will be a range of hands on science exhibits, science shows, Planetariums, Lobster Makeovers and you can make your own LED torch and much more. Why not go along and be involved in some great science. The South Australian Neuroscience Institute (of which I am a memebr) will have a booth there. Maybe I'll see you. I got to see a lovely sight this morning. The International Space Station gliding over the Southern sky, followed a few minutes later by the Shuttle mission STS-118. They weren't close together, as the picture above implies (see this post for an image when they were actually physically close). 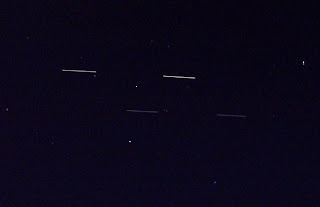 I've just stacked two successive images of the ISS (taken 6 seconds apart, that's why there are two bright streaks) with the two successive images of the shuttle which turned up 3 minutes later. They were in the sky together for around a minute though, on opposite horizons. They were both quite bright, and the shuttle did a flare as it went below the horizon. With the crescent Moon rising on the eastern horizon, a very lovely morning. Over at StarStryder the 15th Carnival of Space lifts off. Lots of stuff on rockets, the use of antimatter as propulsion, life on Mars, dust storms on Mars, space junk and lots more. Why not launch yourself over there now. If you want to nominate a post for the next Carnival the instructions are here. The other day I went looking for a familiar friend, and they were gone. It seemed like only yesterday that I saw them, but it must have been a couple of weeks. Isn't it funny how time gets away from you. Soon my friend will dissapear, and I will miss fantastic Venus. I was quite used to seeing Venus in the daylight, I could find it in moments in my backyard, where I had worked out the landmarks for viewing at different times, I picked it up on a trip to Melbourne (see image to the left, you can just see Venus in the thumbnail, and it comes up nicely when you click on it and enlarge it) in between rain storms. When we went down the beach a couple of weekends ago, with my hand covering the setting Sun I could easily pick out Venus high above the gold tinged waves, while the boys drew in the sand with oyster shells. Then I wanted to show Venus to some friends, and the clouds moved in (so we talked and watched Dr. Who instead). 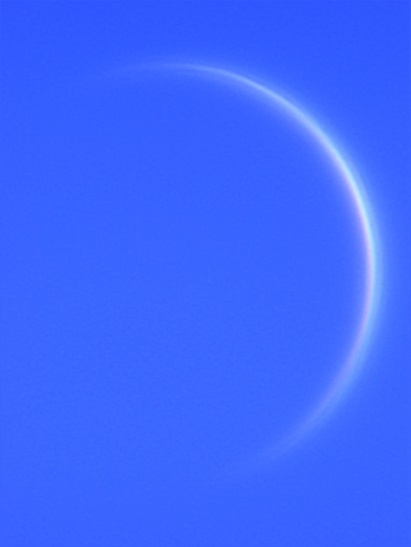 When the clouds finally cleared this Monday, I was distressed to find that I could no longer find Venus in the daylight! Of course, in the intervening weeks Venus had plunged closer to the horiozon, and become dramatically thinner. I rolled out the telescope Monday afternoon, while Venus was still respecibly high in the sky, and saw the thinnest Venus crescent I had ever seen. It was like a hoop of silver wire glowing in the sky. Because Venus was low to the horizon, I couldn't use the 8" scope with time drive, and had to use the 4" unguided scope. Because the optimal time for viewing Venus clashes with the optimnal time for having dinner before the boys go feral, I couldn't set up my imaging system. Instead I whipeed out my handy mobile phone and took the image above. 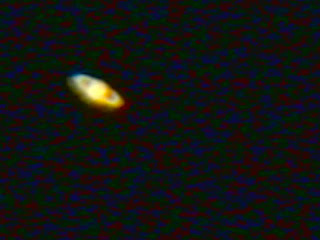 It's not as good as my Jupiter shot, or Lukes Saturn shot, in part because the 4" mounting isn't as robust, and holding the phone to the eyepiece produces more wobbles. In part because I had set the eyepiece on top, and had to stand on my tippy toes to try and hold the camera on. If the clouds roll back, I'll try a more sensibel setup. But I don't have much time, Venus sinks lower every day, after August 14, when Venus, Regulus and the thin crescent Moon can be seen just above the horizon, Venus will be effectively unobservable. But then again, late in August Venus will reappear in the morning skies, so we can renew our aquaintance when I rise in the mornings! Wow, that was fantastic! Tuesday morning was cloud free for a change. When I got up, the sky was clear and sparkly with stars. 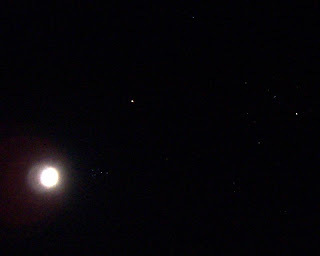 Mars, the Moon and the Pleiades clustered together most attractively (see image to left, click to enlarge for more detail, Aldebaran and the Hyades are to the far right). 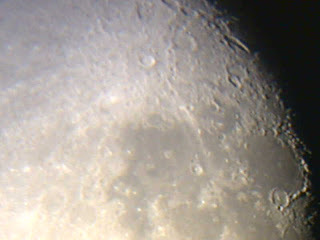 I set up the scope to have a look at the Moon and wait for the ISS. That is when my laptop died, just gave up the ghost. This is rather sad, I know I needed to replace my ageing laptop, but any new one won't be able to run my webcam camera, so astrophotography is out for a while. The sky lightened, the birds began their morning chorus, I could easily see Mars and Aldebaran, and Orion, but the Pleiades and Hyades were more difficult to see. Suddenly, a chip of light appeared above the horizon, the ISS! It moved slowly up the sky, and I started taking images. 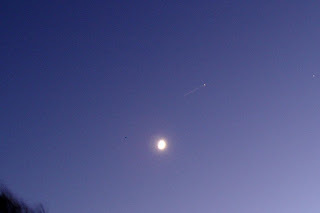 It glided above the Moon and then, it glided straight in front of Mars! That is a pretty rare sight (click on image to the left to enlarge). Then on through the Hyades and up under Orion's belt! I made an animation (1.6 Mb gif file). Aside from the demise of my beloved laptop, it was a pretty spectacular morning. I headed in for my morning cuppa a contented man. 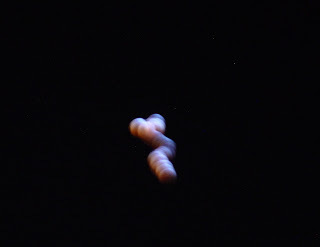 Peter from Marybrough saw Mars pass in front of the Moon, which was pretty cool too. How was your experience? The things you see when you don't have a camera. I was bringing in the scope after a quick peek at Venus, when I looked up and saw a fireball moving across the sky. It was bright, around magnitude -1.0 with flares to at least -4, with a long orange trail. It was moving relatively slowly (more slowly than the Leonids), and passed from Serpens via Virgo into Corvus, where it finally petered out (see image for approximate track) at 6:32 pm ACST. From its characteristics, it could be a piece of space junk, or perhaps an early Lyrid, or even just a random meteor, but it sure was pretty. North eastern horizon as seen from Adelaide at 6:30 am CST Tuesday August 7 (click for Full size chart with ISS satellite timings). People in Adelaide and Brisbane (well South Australia and SE QLD generally) get a bonus on Tuesday morning, not only do they get to see Mars, the Moon and the Pleiades close together, the get to see the ISS glide past them. Adelaide people have the best view, with the -1.0 magnitude (about as bright as Sirius) ISS appearing to almost touch Mars (see above diagram). The ISS will become visible in the North around 6:31 am, then passes the Moon at around 6:33:30, then nearly touches Mars at 6:33:45, then passes through the heart of the Hyades at 6:34 then passes underneath Orion's belt. 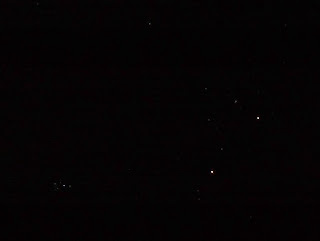 A pretty amazing sight, although it will not 5 minutes from civil twilight, the brighter stars will be easily visible. For people in Brisbane, the ISS becomes visible at magnitude -1.0 roughly North at 5:27 am local time. It will pass under the Moon and Pleiades at around 5:29 local time, then passes the Hyades at 5:30 am, finally passing through Orion at 5:30:30. Sydney observers will see the ISS skim above the horizon between 5:30 and 5:32. The Ice in Space astronomy forums will be 3 years old in September. To celebrate, they are having a competition with cool prizes. Pop over to the competiton page for more details. Moon, Mars and Pleiades in the Morning. The north eastern horizon at approximately 5:00 am local time, Tuesday 7 August (click to enlarge). If you are getting up early on Tueday morning, why not get up a little earlier and view the delighful aparition of the crescent Moon, Mars and The star cluster the Pleiades close together. The Hyades cluster and the constellation Orion are not far way either, making the north easterh horizon rather attractive. The response to my post on mobile phone astrophotography has been amazing. Take these fantastic images, they were taken by Luke Arnott from South Africa using his home made 6 inch Newtonian telescope and his Nokia N90 cell phone. He just held the cell phone camera up to the 25mm eye piece and look at these fantastic results. You can clearly see the rings and ring gaps in this image, it is very clearly Saturn. The Lunar Image is pretty dang good too, lots of detail in the terminator region. DaveP must be envious. The gauntlet is clear thrown down now. Lets see what we can do with our mobiles folks! In my other blog life I blog about evolutionary biology over at the Pandas Thumb. There I have helped point out some of the many errors in Michael Behe's anti-evolutionaty arguments. Behe has a new boook out, "Edge of Evolution", which is mostly the same old tired stuff over again. But in one remakable image (figure 7.4) he claims that HIV has evolved no new protein/protein binding sites. Now over at endogenous retrovirus blog, ERV completely demolishes this claim. As his claim is central to his argument that complex things can't evolve by mutation and natural selection, ERV's post is pretty devestating for Behe. Go over and read it, it's a very good essay (and I'm not saying that just because I drew a diagram for ERV). How time flies! The 14th Carnvival of Space is now available at The Universe Today. With the the anniversary of the Moon landing past, and the anniversary of Pluto's demoting coming up, there is reflection on these themes. Robots, Lunar telescopes and Martian Blueberries are there for the pciking too. Grab your basket and hurry over. If you want to nominate a post for the next Carnival the instructions are here. 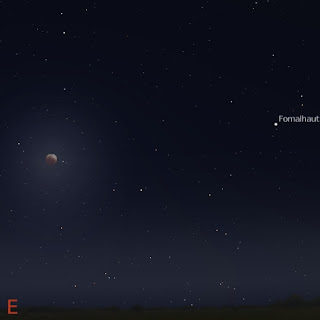 Total Lunar eclipse, as seen on August 28 at 7:00pm local time from Australia. The August edition of Southern Skywatch is now up. Crescent Venus, Mars and the Pleiades, and a very nice Total Lunar Eclipse await us.